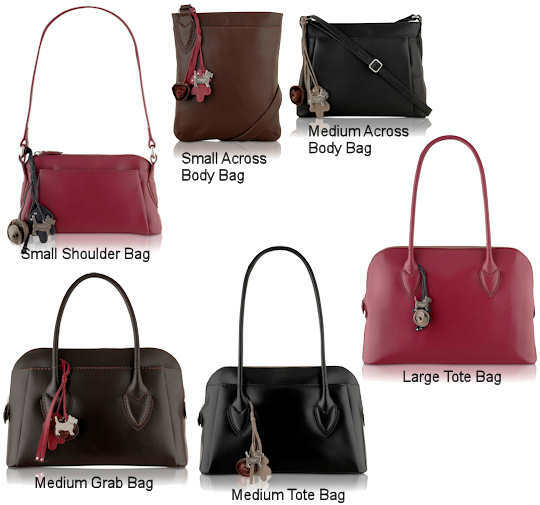 All the bags are made from leather and have a zip top fastening. They have a handbag charm which consists of a metal, silver tone Scottie dog, a leather flower and an oak leaf. All the bags have a single zip pocket and slip pocket inside, with the exception of the Aldgate Medium Tote which has two slip pockets and one zip pocket inside, and the Aldgate Large Tote Bag, which has an interior divided into three with two zip fastening compartments and two slip pockets and a zip pocket inside. Inside, the bags are lined in Scottie dog jacquard fabric and there is a leather brand label. The Large Tote Bag would make an ideal workbag and it would look very smart teamed with a well cut trouser suit and a neat pair of heels. The medium grab bag is more of a day to evening bag which is both chic and practical. The across body bags are great for casual use and travel and the shoulder bag is perfect for a night out, carrying all your essentials in style. Measurements: 23cm x 14cm x 6cm; the length of the strap from the top of the bag to the apex is 25cm. Measurements: 23cm x 27cm x 2cm; the length of the strap from the top of the bag to the apex is 60cm. Measurements: 26m x 19m x 5cm; the length of the strap from the top of the bag to the apex is 60cm. Measurements: 30m x 20m x 10cm; the length of the strap from the top of the bag to the apex is 24cm. Measurements: 39cm x 26cm x 11cm; the length of the strap from the top of the bag to the apex is 22cm.